REST ASSURED! One of the most well-known passages of Scripture is the beautiful and prophetic Psalm 23. We have attempted to encapsulate the very heart of its message with the simple yet extraordinarily profound statement "The Lord is my Shepherd... I lack nothing". 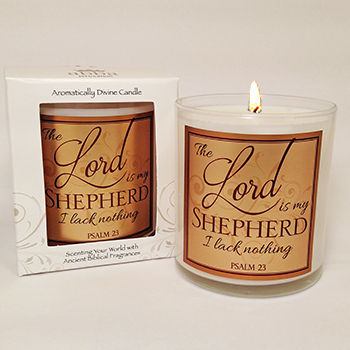 This candle will inspire the believer to boldly proclaim in any and all circumstances: "The LORD is shepherding me"! We chose our Rose of Sharon fragrance for this candle as a representation of the beauty of "green pastures and still waters" in the psalm. Hand-poured in our eco-friendly soy wax blend, this 3"T glass container has approximate burn time of 24-30 hours and is 8.7 oz by volume.